This weekend was memorable for a number of events. While at a personal level, it was memorable for my son getting his Karate Black Belt, for many it was memorable probably due to another famous Indian victory over Pakistan at the World Cup, and for some it was memorable due to Valentine Day. But the one event that will probably have a much larger long term impact is the installation of the AAP government in Delhi. For a party less than 2 years old based on an anti-corruption movement of 3 years or so, and which, after showing early promise had almost messed it up last year, to come back to power with such a stunning majority, albeit in one city state, is nothing short of miraculous. Even David beating Goliath seems like an understatement. My articles on AAP started with my initial thinking that AAP had reached a tipping point after its surprise 28 seats in Delhi, then moved to realizing that I was probably an early adopter of an uncommon man’s agenda, and finally, after a chain of events, theorizing that perhaps, AAP was a disruptive innovation that was getting stuck in the proverbial ‘chasm’ quite similar to how so many innovative products end up in technology marketing. But the kind of sweeping victory that the AAP saw in Delhi is, perhaps, not possible unless it has moved out from being an ‘early adopters’ phenomenon stuck in the chasm (which it was thought to be) to at the very least ‘an early majority’ phenomenon (which it seems like now). 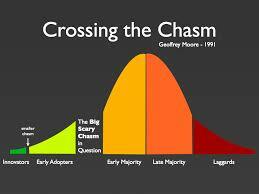 At the early adopter phase, an offering holds promise due to its disruptive idea, but it is backed largely by a smaller group which backs it based on mainly emotional or idealistic principles. Whereas in the ‘early majority’ phase, the offerings’ buyers consists of a pragmatic adopter base which is more solid because that group makes a rational choice after seeing the cost benefits and decides to give it a chance. In a technology product marketing life cycle, generally after the early adopters have taken an innovative product up, there is huge ‘principles-based aspirational marketing’ based on superiority of the offering and bad mouthing the competition, which the AAP did early next year. Unfortunately, while this attracts the early adopters, it doesn’t work to convince the early or late majority who are looking for concrete reasons to make any changes to the status quo. Lack of such reasons is also why lots of products end up in a chasm which not many can easily come out of. Till the early majority sees some benefits compared to status quo, and decide rationally to give it a chance, they stay there, often forever. The AAP with its disruptive idea of honest politics has definitely and quickly moved from the early adopter to the early majority stage. And if this is true then it is bad news for people in power – who themselves capitalized on the promise of a credible alternative. But the good news for the same people is – bear in mind – it is still a chance though a very rational one – meaning the disruptive innovation has moved a few steps forward in being mainstream but is still not mainstream. The next stage in AAP’s emergence is typically adoption by the late majority which can make it completely mainstream. If one goes back to the technology adoption life cycle, this typically happens when the early majority sees proven benefits for specific use cases after using the product for a while, the perceived risk and costs of adopting it go down, and the early adopters become the biggest influencer for starting adoption by the late majority. And that is what is likely to happen with the AAP as well. At this stage is also when most of the competition starts to take notice of what was initially dismissed as something that doesn’t work. Hence, from here on, it is simply a race between the incumbent and the disruptor – because neither has the luxury of the laurels of the past or the promises of the future. We have seen this play out every time a new innovation comes in the market. Success that leads to mainstream adoption depends largely on the ability of the disruptor to fulfil its original promise without the risks of disruption, as well as the approach of the incumbent to reinvent itself to compete on the new innovator’s standards without the arrogance of resorting to past laurels. A famous example of an incumbent leader losing out over a prolonged period of time is how Kodak (a leader in films and film cameras) lost out to Canon when the digital camera slowly replaced film-based cameras with Kodak continuously resisting the shift, even after it was evident that the new technology had moved beyond early adopters. Another recent and more drastic example of disruption is how Nokia and Blackberry who were undisputed mobile leaders lost out completely to Apple and Samsung in the mobile market in a space of just about 3 years due to the smartphone innovation which they didn’t see coming. We see Nokia coming back in its new Windows avatar largely due to a re-invention. A famous example where a disruptive innovation did not quite replace the incumbent is how IBM embraced the PC even when it was a highly successful mainframe leader, had grown based on it and at that time could have easily resisted the PC and dismissed it as a fad (which it initially did). Another similar example is how electric cars somehow never managed to replace fuel-based vehicles despite clear innovation as they got stuck in the chasm after early adoption due to the risks of adoption by the majority. A number of times the best thing for an incumbent to do is to embrace the disruptive innovation rather than to resist and fight it. It needs a proactive action to address a market that it has never addressed directly. Resistance often leads to further erosion till it reaches a point of no return. In the fight for political space with the AAP, the worst thing for the BJP and other parties to do would be to resist it, have an obstructionist, elitist approach or to constantly communicate that they don’t believe in AAP’s ability or intention to deliver on its promises. Due to the massive mandate AAP got in Delhi based on its disruptive idea, that kind of resistance is likely to work against BJP and turn the perception against them in the battle for the early majority in political space. While it is to be seen whether the AAP disruption spreads beyond Delhi, resisting it further will definitely not provide any benefits to the BJP – as the battle for early adopters and the early majority (in Delhi) has already been lost. In order to stop the spread to the rest of the majority, embracing the idea of honest politics, reaching out to the new markets being captured by AAP and continuing to deliver on its own promises is what will help the BJP. So while it works on delivering its national agenda for development, it is important to be seen to be proactively constructive for Delhi, especially for the segment that has clearly moved to AAP. It is a race. For the incumbent BJP, it is a race to hold on to its turf by delivering its original national promises and embrace the new disruptive idea constructively, and for the challenger AAP, it is a race to deliver on its Delhi agenda so that it does not remain an experiment and edges forward as a mainstream player with its national ambitions. At the end of the day, it does look like the voter is the smartest of all. It has left both with little option but to deliver. Most investors find it difficult to truly appreciate the mind-boggling effect of the power of compounding. Financial companies keep touting how 5000 rupees invested regularly will give you 1 crore in 25 years, but most people don’t quite get it. The human brain has a problem with understanding geometric progression. The reason, perhaps, is that the effect seems completely disproportionate to the cause. And our brains don’t seem to be wired for that kind of sudden change. The same kind of disproportionate effect that the power of compounding and geometric progression causes, apparently, also characterizes social epidemics. Malcolm Gladwell, in his famous book ‘The Tipping Point’, claimed that successful social epidemics have three things in common: first – Contagiousness, second – Little things causing Big effects, and third – Dramatic and Sudden Change. The Aam Aadmi Party with its idea of ‘honest politics’ seems to be on its journey of becoming a social epidemic. With the foundation of the ‘Anna movement’, and songs and slogans like the one below that followed its political plunge, they set the stage for a ‘Contagious’ idea. After its Delhi success when it won 28 seats against anybody’s wildest expectations, they probably realized the impact of how little things can cause big effects. That kind of success where a small but focused execution of a powerful, contagious idea paved the way for a disproportionate impact of setting them up for government. Is that the Tipping Point for the Aam Aadmi Party and its idea of honest politics? That time will tell. But it surely seems to have the potential to be one. There are numerous examples of people, organizations, products and ideas that held promise and captured the initial ‘contagious imagination’ but failed to cross over the threshold of the tipping point, and fizzled out. The reasons are many – from the message being diluted, to the messengers not creating stickiness, to dissonance after initial promise, to competitors hijacking the message, or a combination of these. Gladwell goes on to suggest that while the overall ‘social epidemic phenomenon’ is largely unpredictable, some of it can be managed on seeing the signs of it – primarily by focus and belief in the core message and scaling it correctly using the right messengers. For the Aam Aadmi Party, it might mean staying true to ‘honest politics’ and scaling it up with the right people and the right messages around ideology and policy.